Camden's market area in north London is immensely popular. At weekends upwards of 100,000 shoppers and tourists congregate on its 3 major market sites to search for clothes, jewellery and brik-a-brak. The majority of them arrive at Camden Town station. The station is important also as a major interchange between the two branches of the Northern Line (Edgware-Kennington and High Barnet-Morden). Despite mixed train routing on the two branches passengers frequently have to change at Camden to reach their destination. This leads to significantly more congestion across its four platforms than would otherwise be the case. Added to this, Camden Town itself is a well-populated area close to central London. These three factors make it one of the busiest stations on the network and mean that at some periods on weekends access to the 101 year-old station is limited to set-down only, so as to avoid dangerously congesting the platforms. i.e. during these periods no-one may enter the station. This is obviously inconvenient for shoppers wishing to return home as well as locals wishing to make regular journeys. Through passengers, transfer passengers and those arriving are not disrupted. Camden's agglomeration of street and alternative markets attract enormous crowds, especially at weekends. London Underground project a 20% increase over the next 20 years. Furthermore, in the near future the line will be defnitively split into two routes, further increasing the demand for interchange at the station. London Underground quite rightly wishes to remedy the situation so that Camden Town can meet the demands placed on it. They hired Ove Arup to design an entirely new Camden Town station, from the bottom up. At an estimated cost of £135m (these things always overrun), the design requires the demolition of a whole city block, including certain local landmarks of sentimental significance. Among them, the listed Electric Ballroom, one of London's oldest nightclubs; Buck Street market, one of the smaller markets in Camden; and a church. The resulting plan would incorporate new accommodations for the Electric Ballroom and the church as well as commercial office space and would take seven years to construct but significant opposition from residents and Camden Borough Council has led to over 16 versions of these plans being rejected over the last few years. Currently plans are at an impasse, with no adequate solution to satisfy both London Underground's needs below ground and local interests above ground. 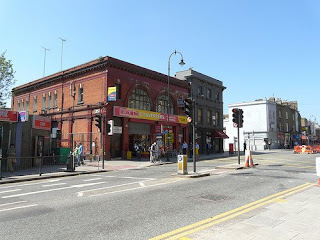 Allegedly, however, in 2007 the government declared that the Electric Ballroom is a dilapidated building, which could swing the tide in the favour of LU's ambitions. The proposed £135m overhaul of Camden Town would look like this. Demolition of a whole city block has led to enormous local opposition. A cursory glance at the plans reveals many of the hallmarks of modern LU station planning. I hesitate to mention words like waste and vanity, in what is merely a rebuild. Including commercial development is undoubtedly part of the business model and it is not clear what long-term income TfL might extract from its tenants. Whilst Ove Arup are an extremely well thought of company, their inclusion may be what the bosses of Madrid Metro warn precisely against in metro construction. Prestige architecture is a luxury that the taxpayer cannot afford and requires cost-cutting in other more essential areas, such as reaching neighbourhoods where there is no service at all. Lottie gets new ballet shoes while Tom and Charlie go barefoot. At £135m it's an expensive enlargement. Even without detailed statistical data it can be seen that stations 2, 3 and 4 cannot significantly reduce passenger demand for Camden Town station. The same conclusion has been reached by London Underground and Camden Borough Council. Doing nothing is not an option. But with the redevelopment plans on the buffers, are there any other alternatives? Here I shall briefly put forward some new scenarios. Option 1 - Rebuild Camden Town station in a different place. The existing station could operate mostly unimpeded whilst works progress. Sensitive conservation sites and landmarks need not be disturbed as in the current plans, or at worse, less sensitive ones demolished. New ticket halls and escalators can be excavated directly under the street. Two railway lines pass very close to Camden Market. One is the North London Line, with stations already at Camden Road and Kentish Town West. The other is a link between the NLL and the Watford-Euston Line. This line is not currently an Overground route though maps of the network's future do display it offering through services between the two lines. Station construction on this stretch would be relatively straightforward and inexpensive as there is plenty of elbow room around the site. The main problem with this idea would be the need to rethink Overground routings and the issue of train frequency (which currently stands at 4tph on the NLL). To be viable the station would have to offer through services between Willesden Green (or even Watford) and Stratford thus allowing useful interchange at Dalston (ELL), Highbury and Islington (Victoria) and Queen's Park (Bakerloo), as well as the termini; and increased train frequencies to say 8tph. It would replace the function of Camden Road and KTW relative to this site. Would require adaptation of LO's long-term strategy to be viable. London Overground does not yet have the image of "convenience" that would attract passengers in the same way that an Underground station would. That may change. Interchange on LO is limited and the east-west axis of the line would not necessarily be conducive for journeys to or through central London. N.B. There is also space to locate a station directly on the NLL, thus not impacting Overground routings. Once again train frequency would have to improve and the station itself would be marginally further from the markets. In effect, this would be a replacement for Camden Road station which would likely become unviable. Option 3 - Refit Camden Town to a basic level and provide extra capacity in a new station nearby. A "Camden Market" underground station halfway up Chalk Farm Road (see map), close to the nodal centre of the markets would attract significant shopper traffic away from Camden Town (and also Chalk Farm). Being at only 150m from the nodal point, the station would undoubtedly attract the majority of passengers from south, central London and the Edgware branch wishing to visit the market. Camden Town would be left to cope with predominantly High Barnet traffic, regular local catchment and transfer passengers - well within its capacity. How big would Camden Market station have to be? Well, on a rough assumption, around 50-75% of all market traffic would alight here. Once the Northern Line's running is definitively split passengers on the High Barnet-Morden branch would still use Camden Town as changing to the Edgware branch for one station would be inefficient. However since most journeys will not originate on the Northern Line, many passengers would be expected to reroute their journeys to interchange onto the Edgware-Kennington line at Euston, Tottenham Court Road and Embankment, etc. Add to this the residential catchment but remember it would not have the interchange problems that Camden Town does. It would likely have to be no significantly bigger than any of the other Edgware branch stations e.g. Chalk Farm, although weekend demand spikes would be very marked, so wider platforms would be an asset. 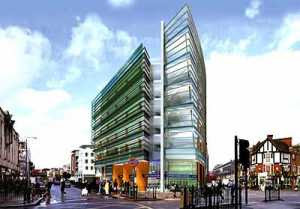 As to construction sites, this proposal is in the vicinity of Camden's stable market. This large site still contains semi-permanent structures and could feasibly be excavated for construction of an Underground station, without major planning issues. Some local protest would undoubtedly be stirred because of disruption during works, but upon completion the market could return to normality, barring one or two well-located station entrances. Try to see this as an enlargement of Camden Town with an extra pair of platforms up the road. Minimal disruption to Camden Town station during works and all buildings remain. Some disruption to traffic on Chalk Farm Road and possibly demolitions during works. South Kentish Town station lies about 600m north of Camden Town up the Kentish Town road. It was one of the original stations on High Barnet branch of the Northern Line. It closed during a strike in 1924 but was never reopened as passenger demand was never very high. The station structures remain in place and the station building is now a commercial outlet. The walking distance from the nodal point is 570m. It would therefore be the second closest station to the market area, but still generally less convenient than Camden Town (depending on which side of the markets you are on). It could be expected to divert a major chunk of northbound High Barnet branch passengers even if the doors are open at Camden Town. The natural incentive of escaping the crowded area around Camden Town might contribute to this organically. As the sole improvement in the area it would be a great convenience to many more passengers (south and northbound) whilst Camden Town remains set-down only, although obviously not ideal. As in the case of Chalk Farm, the use of the station for south and central London would mostly be counter-intuitive for reasons listed earlier. However, the pedestrian route from Camden Market doglegs and there may be ways to improve passenger access with a more direct right of way, possibly incorporating a subway, and any feasibility study should investigate this. The great attraction of this scheme is that in Underground terms it would be extremely good value for money. No excavation is required, just a refurbishment. The short timescales involved would make it a "quick fix" solution, if not a comprehensive one. Leslie Green's original South Kentish Town station. Being less than 600m walk from Camden's principal markets makes it a viable alternative to Camden Town, and extremely good value for money. No demolition/controversy required and Camden Town's buildings undisturbed. Some disruption to traffic on Kentish Town Road during works. Creating a new "Camden Market" station on Chalk Farm Road and reopening the disused South Kentish Town Station in combination would add significant station capacity to both the Edgware and High Barnet branches in the Camden market vicinity. This would negate the need for expansion works at Camden Town. A simple refit would suffice. Additionally passenger convenience is increased for the local catchment area by providing journeys closer to origin and destination. A reduction in pedestrian congestion is also likely in the crowded streets as pedestrian journeys would be cut. Most significantly of all, the two station projects in combination would likely cost far less than the £135m Camden Town projection, could be completed within three years and would not cause the upheaval amongst local residents that demolition of such local icons as the Electric Ballroom can cause. Taking 30 random stations on the Underground or Overground and planning the most convenient route to visit Camden Markets shows the following changes in station usage. Preferred station currently is listed first, preferred station with the 3 notional stations (Camden Market Underground CMU, Camden Market Overground CMO, South Kentish Town SKT) available is listed second. In this sample 21 of the journeys (70%) currently terminate at Camden Town. 7 of the Camden Town journeys are unaffected (33%), 12 change to CMU (57%), 1 changes to CMO (5%) and 1 changes to SKT (5%). i.e. the new stations divert 67% of journeys away from Camden Town. 5 journeys (17%) terminate at Camden Road. Of these, all 5 (100%) would prefer CMO. 2 journeys (7%) terminates at Kentish Town West and would also prefer CMO (100%). 2 journeys (7%) terminates at Chalk Farm and would prefer CMU (100%). Camden Town receives the bulk of traffic for Camden Markets. Camden Market Underground station would have the potential to remove around 50% of Market passenger traffic from Camden Town. What proportion of Camden Town's total traffic that would be (including interchange passengers, and normal catchment) is not clear but it is undoubtedly very significant. It would also take traffic away from Chalk Farm, although the volume is less significant there. South Kentish Town would displace far fewer passengers, but, again a 5-10% reduction may be highly useful considering the modest cost of refurbishing that station. The case for an Overground station at Camden Market looks weak as it does not displace many journeys from Camden Town in this sampling (just the one from Finsbury Park). It is undoubtedly preferable to Camden Road, or Kentish Town West, however, for Overground journeys. Good analysis & suggested alternatives. Any uptake or council study of these ideas?